A cross-over clinical study was conducted among school children of Sri Sajjan Rao Vidya Samaste, Bsavangudi south Bengaluru. Ethical clearance was taken from Institutional Ethical Review Committee. Informed consent was taken from Principal of school and parents, or care taker of each student participated in the study. Children with normal salivary function, not with any anticholinergic therapy and decayed, missing, and filled teeth >2 were included in the study. Subjects on antibiotic therapy 2 weeks prior study, xerostomia, lactose intolerance, allergy to any of the test products, wearing orthodontic appliances were excluded from the study. Finally a total of 60 subjects of 10-13 years, participated in the study. The study subjects were recruited from four classes of School and were divided into four groups A, B, C, and D with each group containing 15 subjects. The four test drinks used in the study were Coca-Cola, Pulpy orange, Sweet lassi, Milk. The endogenous pH and total sugar content of all the test drinks were measured. 1-day before the test day all subjects were instructed not to brush their teeth for at least 24 h before the examination schedule for allowing plaque accumulation, with bacterial colony formation and for easier harvesting of plaque sample from tooth surface and were asked to refrain from any kind of food or drink for 2:30 h before sample collection. The study was conducted for 21 days in the month of July 2013. After 1 st day of study, a 7 days of washout time was given for each cross-over and 3 such cross over was done during the study and the drinks were interchanged. Before allotting beverages to the subjects, plaque, and salivary samples were collected from each individual, and their pH was measured which formed the baseline. Subjects were asked to rinse their mouth with respective beverages allotted to them. Plaque samples were collected from six different and easily accessible surfaces of the upper central incisors, buccal surfaces of the upper first pre-molars and molars, lingual surfaces of the lower molars and incisors. The sample was collected at 2 min, 5 min, 10 min, 20 min and 30 min, using spoon excavator. Followed by which saliva samples were collected in the test tubes in 2 min, 5 min, 10 min, 20 min, 30 min and diluted with 10 ml distilled water. Both the samples of each study subject were sent for estimation of the pH at chemistry research laboratory of Bangalore institute of technology, Bangalore. Plaque and salivary pH were measured, and following parameters were derived and analyzed. These were (1) maximum drop in plaque pH from baseline; (2) minimum pH reached after challenging with the test drinks; (3) the area under resting pH, (4) area under curve (AUC). Comparisons of the above measurement among test drinks were determined using ANOVA both within and between groups and to know whether the difference were significant or not Bonfferroni's post-hoc test was used. Statistical significance was assessed at the level of 5%. In a total 60 students, 32 were males, and 28 were females. Of all the test drink, sweet lassi was found to be having maximum total sugar content of 15 g/100 ml, and Coca-Cola had the lowest pH 5.3. Milk showed least sugar content (5 mg/100 ml) and highest pH (6.7) [Table 1]. All test drink showed the ability to lower the plaque and salivary pH below the prerinse baseline level significantly except milk. They showed drop in plaque and salivary pH 2 min after rinse was tested, the pH recorded was below the baseline in entire duration of observation, each test drink after initial drop showed gradual increase in pH [Table 2]. Coca-Cola showed the pH value of 5.44 (0.134), which is below the critical level at 2 min after the consumption of the beverage, followed by slow increase in 30 min of observation [Table 3]. Whereas in saliva none of the test drinks showed the ability to lower the pH below the critical level. Coca-Cola 2 min after the rinse showed the minimum salivary pH with the value of 5.57 (0.29) [Table 4]. Coca-Cola showed maximum drop in pH for plaque 1.25 (0.086) and saliva 1.14 (0.093) in respect to other test drinks, and this was a significant finding in our study [Table 3] and [Table 4]. The maximal drop of initial pH was seen with cola at the time of 2 min with value below critical pH value, samples collected afterward does not show values below the critical pH value though it remains below the baseline levels and till the 30 min of observation pulpy orange also showed sudden drop in pH after consumption with least pH value recorded to be (5.77 ± 0.092) at time of 2 min but it showed sharp increase in pH compared to other drinks, sweet lassi showed a late response with maximal drop of pH at 5 min, with the value of (5.82 ± 0.098) but pH recovery was rather slow compared to pulpy orange, while milk showed least drop in pH which was almost constant with respect of time and was found to have a different pH response compared to other test drink [Table 3] and [Figure 1]. Coca-Cola showed maximal drop in pH with lowest recorded value of (5.57, standard deviation = 0.29) with the sample collected at 2 min, followed by slow rise with respect to time with the salivary pH (6.10) at 30 min [Table 4] and [Figure 2]. 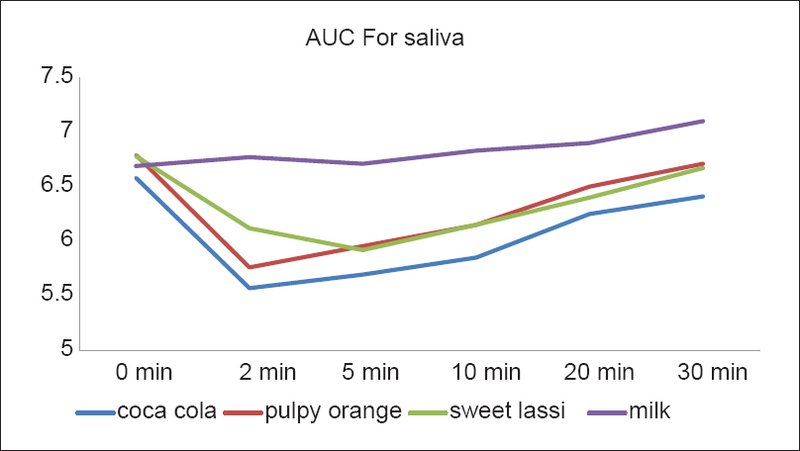 Sweet lassi showed the lowest recorded pH in saliva at time 5 min, followed by a slow recovery than pulpy orange; it was seen that lower pH was continued for more time in lassi as compared to pulpy orange. As seen in plaque, in saliva also pH drop was least with milk and was almost constant with respect to time. ANOVA showed a significant difference among the all beverages for all the parameters for both plaque and saliva. Bonferroni post-hoc test showed that there were significant differences between Coca-Cola, Pulpy Orange and Sweet lassi from milk. Soft drinks containing inherent acids and sugars are both acidogenic and cariogenic potential. Many studies showed a positive relationship between caries and dental erosion and the consumption of soft drinks. Dental erosion (erosive tooth wear) is the situation of a chronic loss of dental hard tissue that is chemically etched away from the tooth surface by acid and/or chelation without bacterial involvement. Acids of intrinsic (gastrointestinal) and extrinsic (dietary and environmental) origins are also the main etiologic factors. The clinical manifestations and diagnosis of diseases caused by soft drinks should be regarded as a combination of erosion and caries,  and clinicians should pay more attention to it. Hence the study was conducted to assess the acidity and total sugar content of four different commercially available beverages commonly consumed by children and its time-dependent effect on plaque and salivary pH. In a study Thambassebi et al. concluded that plaque pH response were significantly less acidic in children than adults,  so the present study was conducted on school children of age group 10-13 years. Subjects were asked to refrain from tooth brushing 24 h before the test as oral hygiene has a critical role in the maintenance of pH, and proper hygiene would washout the acids formed in the oral cavity. Both salivary, as well as plaque pH, were assessed in the study as plaque pH gives the picture of pH drop at localized area and salivary pH provides generalized status of pH of oral cavity hence both are assessed at same time intervals. In this study it was founded that Coca-Cola had the lowest inherent pH, followed by minute maid pulpy orange, Nandini ready to drink sweet lassi, milk showed highest inherent pH, these findings are in accordance to the findings of the study done by Huang et al. and Saeed and Al-Tinawi  (2010) in their study they have found Carbonated beverages as having the least pH compared to the other test drinks used and milk has the highest, though the values which we have got is a little higher the reason may be the difference of the electrode used for pH estimation. The low pH of food is an important factor in the pathogenesis of dental caries, but initiation of dental caries is determined not only by its acidogenicity but many other modifying factors in food such as sugar content, frequency of intake, retention of the food in oral cavity. Hence, keeping these things in mind sugar content of these test drinks was measured. In our study we have found that highest total sugar content was associated with sweet lassi, followed by Coca-Cola, minute maid pulpy orange, least sugar content was present in milk. This is in contrast to the findings of the Saeed  in their study though they found sugar content of carbonated beverages to be highest but it was almost similar to orange fruit juice. In this study we have calculated the "maximum drop of pH" in plaque and saliva for all the test drinks, the mean value for pH drop in plaque as well as for saliva was highest for Coca-Cola, followed by pulpy orange, Sweet lassi and Milk in order. All findings were statistically significant within and between the groups. There was an insignificant pH drop recorded with milk compared to other test drinks. These findings are in accordance to the findings of Bowen. Another entity recorded was "minimum pH" of plaque and saliva for all test drinks, the values of pH recorded were minimum for Coca-Cola for both plaque and for saliva, followed by pulpy orange, sweet lassi, and milk. The factor of high sugar content of the carbonated beverage may also contribute to this pH fall, but the association is less clear because in our study we found that sweet lassi was having more sugar content than Coca-Cola. Area under the curve was considered because caries is a chronic infectious disease, so it is a time dependent entity. Area which we have calculated in our study is under Stephen's curve. Hence, development of dental caries depends not only upon the maximum level of pH drop but also on time such drop is maintained. AUC for plaque shows initial drop in pH was more pronounced with the Coca-Cola throughout the period, while pulpy orange also shows the steep drop of pH but recovery of pH is more rapid and reason may be the ability of a sour fruit juice to induce more salivary secretion, least area covered under curve was with milk. Lim S, et al. found that the three sugared drinks most consumed by low-income African-American children in Detroit were soft drinks, milk, and 100% fruit juices. Using a cross-sectional analysis they demonstrated that high consumption of soft drinks in the presence of dental plaque deposits was significantly related to caries in low-income children. In our study, we have not only done comparison of pH change between all test drinks but also within the same drink at different time intervals. All drinks showed a significant drop in pH from baseline, except milk while the difference of pH drop of different drinks at same time interval was also significant. In the present study, the mean minimum pH, ΔpH, and AUC values for cola showed lowest value for both saliva and plaque in plaque it has reached below 5.5 and was significantly different from the other drinks, which is in accordance to the study done Huang et al. but was contrary to the findings of Bowen and Lawrence. The lower pH and duration for which drop was continued signifies the cariogenicity of the beverage which was higher for Cola. Soft drinks have many potential health problems, including dental caries and enamel erosion. McIntyre reported in his study that dental caries may result from a long-term high intake of soft drinks and deterioration in oral hygiene patterns. In other cases, slowly progressed caries may suddenly become rampant. This may result from frequent exposure to erosive acids. In animal studies done by Banan and Hegde, Acidified sugar-containing drinks have been found to be cariogenic and erosive in rats. More studies showed that dental caries was associated with the drinking methods. Holding the drink longer in the mouth, and higher frequency of intake of such drinks leads to a more pronounced pH drop. We recommend that other factors such as salivary flow, buffering action of saliva should also be considered to know the relative caries risk of the study population and frequency of intake should also be considered. This study was done among children with similar background, which could be eliminated by taking children of different economic background because dietary pattern vary among different social strata. To conclude, Coca-Cola showed least pH while milk has highest pH consumption of Cola resulted in the drop of plaque pH below the critical pH level and its frequent consumption can lead to destruction of dental hard tissue. Efforts should be made by manufactures to try and modify the composition of drinks in order to reduce the potentially harmful effects on teeth. The authors would like to thank the school children who took the participation in study, and Mr. Venkatesh and Dr. Y S Bhat, Department of Chemistry BIT Engineering College Bangalore for their Co-operation in conducting all Chemical analysis in the study. Jawale BA, Bendgude V, Mahuli AV, Dave B, Kulkarni H, Mittal S. Dental plaque pH variation with regular soft drink, diet soft drink and high energy drink: An in vivo study. J Contemp Dent Pract 2012;13:201-4. Thambassebi JF, Duggal MS, Malik Kotru G, MEJ Curzon. Soft drinks and dental health: A review of current literature. J Dent 2006;34:2-11. Johansson I, Larsson B, Nordlund A, Ericson T. Diet and dental caries. Am J Clin Nutr 1994;59 Suppl:788S. Walsh LJ. Dental plaque fermentation and its role in caries risk assessment. International Dentistry South Africa 2011;8:34-40. Cheng R, Yang H, Shao MY, Hu T, Zhou XD. Dental erosion and severe tooth decay related to soft drinks: A case report and literature review. J Zhejiang Univ Sci B 2009;10:395-9. Huang GF, Chang HH, Wang YL, Guo MK. Effect of oral rinse with soft drinks on human plaque pH. Chin Dent J 2001;20:83-92. Touger-Decker R, van Loveren C Sugars and dental caries. Am J Clin Nutr 2003;78:881S-92. Lim S, Sohn W, Burt BA, Sandretto AM, Kolker JL, Marshall TA, et al. Cariogenicity of soft drinks, milk and fruit juice in low-income African-American children: A longitudinal study. J Am Dent Assoc 2008;139:959-67. Majewski RF. Adolescent caries: A discussion on diet and other factors, including soft drink consumption. J Mich Dent Assoc 2001;83:32-4. McIntyre JM. Erosion. Aust Prosthodont J 1992;6:17-25. Banan LK, Hegde AM. Plaque and salivary pH changes after consumption of fresh fruit juices. J Clin Pediatr Dent 2005;30:9-13.